Writing this feedback the word that is coming up for me is integrity, I think in the form the day took as well as the content of the discussions and the stories. Integrity to one’s own voice or needs seemed to be a theme. A memorable moment was Deborah looking at Sophie Scholl’s and Traudl Junge’s stories and the examination of personal responsibility was quite enlightening. The stories set the tone with their at times piercing self-examination, and then Deborah/other group members were open and genuine, and it seemed in a way that they were expressing parts of their ‘deep self’. For that reason I found it quite inspiring and comforting to be part of the group, even though I largely stayed in an observer role. I enjoyed the group members’ communications. Possibly another word that comes up is authenticity, or a striving towards this. The day was also intellectually motivating and I shared a bit of Deborah’s project/website with my classmates. I was interested in the discussion of love and power, and also found the ‘directory of gratitude’ to be quite uplifting, however the idea of ‘wound words’ really resonated with my classmates – it seems somehow a simple yet profound idea to use this in relation to our selves and also work we are learning to do with others. I was very glad to attend and think the day will stay with me for some time. It is always inspirational to work with someone who embodies their work. And so it is with this workshop. Time is given to participants to look at the exhibition and make connections with individual stories and when sitting in a circle I had the feeling that those people in the exhibition were ‘listening’ to us. Deborah’s courage to tell her own story gives us all permission to do this too. I found it helpful to hear her story and then the story of some of the people from the exhibition and then others were invited to participate in whatever way they wished. There is order in the arrangement but I did not feel in any way as if I ‘had to.’ The space was well held by Kirsten and Deborah and was safe. We only had the one day to do this work so it felt like a short introduction to work that seems to me to carry immense potential. My work is with women who have been sexually abused and their question is always ‘Why’? To me this is a spiritual question which is difficult for us to answer. I sense that this work has the possibility of addressing this question through the sharing of each other’s stories. Deborah shows us her ‘spiritual family’ and gives us the opportunity to create our own. I only came across the exhibition on line. it has been wonderful for me to trawl through the various stories, a few a day, carrying them with me into my own becoming, passing on the site to friends. This work of becoming a “deep Self” is alive for me. I have found Deborah’s contribution to the process has vitality and great value. I suspect that if it were in a live setting I was doing this rather than online the value would be far greater. Comments: Last month I was at the workshop,’Personal Creativity to Re-imagine the World’, which was run by Deborah, Mia, and Emily. A wide collection of people from all kinds of work,business and professions were there. This is a collection of larger than life (possibly} portraits of members of Deborah’s community, with a narrative from or about their life underneath……..a story of each life, descibing a personal process of transformation. With these powerful images around us we were all,in our own ways able to absorb a sense of possibility, both individually and collectively. This was the possibility for change. A process out of which comes positive results from a negative situation…..a transformation from negative to positive. A lotus from the swamp; a phoenix from the fire; redemption out of suffering. The symbolism of the lotus flower is to do with how a flower of such untouched beauty can grow out of murky and muddy water, and how the flower has no smear of mud on its petals. That of the phoenix is to do with the Phoenix’s ability to be reborn from its own ashes, and begin life anew. This really is so reminiscent of the understanding of the word metanoia. The usual translation from the Greek word ‘metanoia’ is ‘repentance’. Literally, and taking it’s more subtle nuance, it means a ‘change of heart…..the transformation from a ‘heart of stone’ to a ‘heart of flesh’. A turning around; a coming back on course. What a valuable day! One which shows us a broad vision for change…..a coming out from darkness into the light. Thank you to Deborah, Mia and Emily! I met Deborah through her Social Sculpture, which she exhibited in the Town Hall and at several churches, and in the Synagogue in Oxford, and which we then invited her to bring to Wadham College. The Social Sculpture stayed at Wadham for the duration of Queer Week. Its theme is ‘The Search for the Deep Self’, and it tells significant stories from people’s lives; times when they have faced and overcome difficulties, and in the process found new life for themselves and others. It strongly conveys the utter dependence of social well-being on individual, personal well-being, and also helps people not to be alarmed by desert-type experiences in their lives, because it is through these experiences that important changes can happen. I thought it would be a great asset in clergy-training and similar sorts of training, especially for addressing the bewilderment people go through when they are stripped back and they wonder why they are going through a painful process of dismantling when they are expecting to be built up and equipped. Walking round the exhibition I experienced a great sense of wonder at how our lives are connected through the journey we all take part in. Here was a portrait of myself and my story,sharing the same wall as Patricia Orange and Marianne Saunders, whom I had lived and worked with over 30 years ago in Camphill. It had such an impact on me as I always thought of myself as a `small person` who was never going to do anything great or make much of a difference in the world. I was always curious about the lives of others and never felt that I could be someone with a story to tell but here I was standing in front of this wall of impressive people and my face was staring back at me! Comments: I am priest in The Christian Community. When I saw the exhibition and read story after story of peoples lifes, of the moments which changed their lifes, of their deepest wishes, hopes and wounds I felt strongly reminded of a sentence in the gospel. At the very end of the gospel according to St.John it is said: ‘Jesus did many other things as well. If every one of them were written down, I suppose that even the whole world would not have room for the books that would be written.’ For me (or: I believe? I think?) Deborah’s exhibition shows parts of these unwritten books. Comments: Deborah – lovely website! I have been thinking that becoming a self is not a moment in time but is a series of hundreds of thousands of moments in a life-time. Some of the selves have completed their lives so it is possible to look back and see what is the important story to tell; though for some, their stories are told from the point of view of another, because they themselves have died. For others of us, the narrative is still unfolding and we are continuing to become. It would be interesting in the future to see what living contributors feel when we look back at the moment in time when we wrote or told our stories. For me this project co-incided with the moment in my life when I urgently needed to become my self. How can I ever thank you? 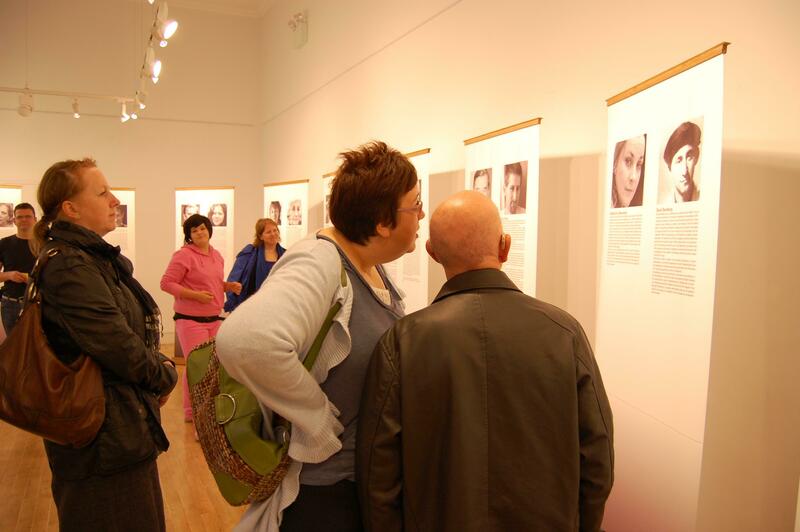 On seeing, and being extremely moved by the collection of powerful stories in the Becoming a Self exhibition, I was struck by the ease with which we can fall into an assumption that these are somehow special people, with special stories….which they are of course,…. but not to the extent that every person we pass in the street is not also special and is also carrying with them a story. The title for the exhibition is “becoming a self in my street”…..even so,I am left wondering how much we viewing public are truly alert to this. We are very moved by the stories, and they affect almost everyone in a particular way, and we feel a love for the individuals as fellow human beings. How wonderful, if through the Becoming a Self exhibition, an awareness can be enhanced in us all, that every person carries with them a potential and moving story of being human,…. so that we all can become alert to those individuals around us ‘in our street’,in a similar way but without the necessity of even knowing the details of each of their stories. If we were able to do this, it would be the beginnings of the spread of a truthful desire for peace, our universal love would grow, and bang would go our instinctive rush to put people conveniently into boxes with our own judgement labels marked on them! So I made a mental note, after this, to continue keeping alive in me the conscious realisation that every person in the street has their story to tell, whether I hear it or not; and to go forward with this in mind. Comments: Today you visited Queen’s to share about your work. I have a form of Asperger’s Syndrome, and as such have difficulty in certain social situations, and find it difficult to be able to reach the heart of someone, as much as lives and people fascinate me. Seeing the banners with many faces was much like a crowded room, and I could imagine everyone talking all at once, which would overwhelm me. However, the banners were like a frozen moment in time, as if each person portrayed gave permission, invited the viewer to interface with and be part of their life story. It allowed me personally to for once not be concerned about personal boundaries, and to discover the person behind the photo – to know them – and from them, learn. Thank you for this work. Thank you for inviting us in to your world. Bless you. He felt a new sense of what he could become for the people around him. He decided to be what was needed in that tough world where no one dared show any weakness. His choice of been vulnerable to his old world and self gave way for newness which was more profitable to the community. We do not always need to be the strong people the world expects us to be: there is always an inner, softer self that will lead us to new realities. This is not about weakness but is about being strong enough to allow the life and hope in our chaotic situations to emerge into something more beautiful. I was lucky enough to get to know Deborah and her work in Oxford, at a Learning Festival promoted by Reos Partners. I say luck because I know that many people would spend their entire life without having an opportunity like this, to be encouraged to go in search of our deeper self. And I say Deborah and her work but this is redundant. Deborah is her work and the work is Deborah. The first story that she tells is hers and how a newspaper article woke up her deepest desire, the desire to help people to become themselves. And Deborah is living proof of how powerful it is. She is totally connected with her deepest purposes and that makes her so powerful, that just by being there she inspires us. So Deborah collected a few other stories from many different people who were connected with themselves, and she places all the stories around us. Stories and faces, they are around us, telling us with their stories that we can also do it! It is all really powerful! So when I sat in the circle to share my thoughts with the group, my entire body was shaking, and I felt really alive! I cried as I told everybody that I am an actress, and I love it, but it is also so difficult and sometimes I just ask myself what is the point? So much hassle for what? To be famous? That can not be my deepest purpose. So I looked at Deborah, and her eyes were also red. But she was calm and powerful. She had this look that says – It’s not easy, but you are on the right path, just keep going and keep searching for your deepest self! I don’t know if these would really be her words. I just felt like this. She will not have the answer for each of us but she is the proof that it is possible because she is there, totally connected with her deepest self and she multiplies it by sharing it with us. So thank you Deborah and all the faces and stories you shared with us. These are just a few words of thousands that I could write about the wonderful experiences that I shared with Deborah and will carry with forever more. Deborah brought her Social Sculpture project, The Search for the Deep Self, to co-create three Reos Partners’ events; Personal Creativity to Re-imagine the World One Day Workshop and the annual Reos Social Change Festival, themed “What is the role of creativity in a complex world in 2011.” The Deep Self was an important contribution to both events. In the first workshop, participants used the Deep Self as the basis of story telling and reflection about their own work and deeper selves. This workshop was ran twice with registered members of the public in Oxford. During the social change festival, the third event, Deborah ran a session on the Deep Self on both days of the festival, and around 40 people went through the process of engaging with the exhibition and reflecting on personal transformation as well as story telling, and considering what implications the project had for their own lives. The Deep Self was a success as part of a workshop and part of the festival, as it was an innovative medium for individuals to ask deep and searching questions, in a caring and dynamic group setting. Many participants spoke of how they benefited from the Deep Self personally, as well as igniting a passion in them for the practice of social sculpture and Deborah’s own practice. surprises for me! The new understanding evoked by Deborah’s work is about the power of engaging in a constellation of stories. This constellation is multilayered, involving the stories of transformation and change that Deborah has collected and standing side by side to each other on big white banners; then our – that is participants’ – engagement with and reflection upon these stories; and also our own personal stories that we shared with each other within this context. This tapestry of stories guides us along in becoming. In a recent visit to Germany, Deborah Ravetz brought her work “The Search for the Deep Self” to the Hamburg Priest seminary for the Christian Community. Working with an interpreter, the piece was presented over a period of four afternoon sessions, each of two hours duration. A group of nine seminarists, along with the seminar director and a further staff member attended the sessions. The group was invited to sit in a circle, enveloped by a further ring of placards. Upon these placards are life-size pictures of the heads of famous and non-famous persons. Underneath each of these heads, is reproduced a text. The students are first welcomed, and then introduced to the idea of the ‘social sculpture’, a form of artistic process perhaps made most famous by the German artist, Joseph Beuys. Then, they are invited to take time to peruse the placards, and read the texts. The students, curious and eager to participate begin to move about, and search out their first ‘encounter’. A silence begins to descend in the room. Awareness of the other begins to dissolve, as each student is drawn into the encounter with one or other of the placards. Firstly, the face on the placard board may attract one towards them. Often a famous face stands next to an unfamiliar one – to whom is one drawn? Is it the familiarity of the famous face that we already ‘know’? Or is it the unfamiliar that first beckons? Soon, the concept of ‘famous’ and ‘non-famous’ both dissolve. Only an ineffable quality remains: The Human. Soon the name of the person begins to lose its usual authority. Instead the characterising principle becomes the text printed beneath the face. The text is relatively brief. Each text is a spoken or written account by the individual pictured, relating a moment or time of great import in that person’s life. Invariably the account involves an apparently crushing moment of destiny, followed by a turning point. This turning point, this resurrection one could say, is not only unanticipated by the individual, but also does not conform to any expectations that may have been entertained. It is not a happy ending. Nor, however, is a tragedy thereby implied. It is merely the further unfolding of destiny, but now imbued with a new meaning wrested from the experience of pain. In this text, we are swiftly drawn into an intense encounter, with a pace to which we are perhaps unaccustomed. We are perhaps able to bear it purely by the fact that we are not meeting these people face to face, but only their simulacra. And yet, we are meeting them. They are present, in a way that is inexplicable and initially confusing. The en-counter is almost like looking into a mirror. Yet it is a mirror that does not merely reflect a surface back. It is a mirror in which each of us begins to see deeper than the surface reflection. Each of us sees anew. We recognise our true self, our deep self. And this deep Self resides there somehow in the Other. The individual faces begin to merge into an Archetypal face, like a Jawlensky portrait. A face of immense beauty and mystery, seems to abide there behind the myriad masks of human faces. The individual faces are no longer important. Beneath them, the body of language has become their Self. And in reading it, we lose the experience of separation from this Self. We mingle with it in some mysterious communion. The experience that each text relates, is seemingly printed into these bodies, in various configurations of Logoi: configurations of words, and meanings. The Self is the text, the deep Self the author of the text: The true author-ity. We are invited to share our impressions with each other. The silence continues. Each begins the journey back to themselves, attempting to digest the impressions, collect one’s thoughts, and articulate the experience. We prepare to share that with which we have come back from this abyss, each like a Gilgamesh that has swum to the bottom of the lake to bring back a mysterious plant of renewing life. Now the social sculptural process can begin. The ring of faces silently looks on, like so many timeless monoliths. In der Begegnung mit Dir, Deborah, sprachen wir über die Bedeutung unserer Namen und stellten fest, dass in dieser unser Lebensauftrag steckt. Im Vergleich unserer Lebenswege und unserer Art der Schicksalsbewältigungen wurde deutlich, dass, um das eigene Selbst zu entwickeln und zu finden, Schicksalsbegegnungen mit anderen Menschen die wichtigste Voraussetzung waren und immer noch sind. Ich finde es wunderbar, das Du Dich mit Deiner Ausstellung mit den unterschiedlichsten Biographien, die Dein Leben bereichern, und Deinen Seminaren – als Deinem Programm der Selbstfindung – in die Öffentlichkeit stellst und damit im ständig Gespräch bleibst mit uns, die dasselbe suchen und leben wollen, um das für uns Menschen wichtigste Ziel zu erreichen – ein selbstbewusstes Leben in der Liebe zur allumfassenden Welt. DANKE dafür !!! In the encounter with you, Deborah, we talked about the significance of our names, and found that this is in our life’s mission. In comparing our way of life and the way we try to master our destinies, it became clear that in order to develop one’s own self, destiny encounters with other people are the most important precondition. I think it’s wonderful that you take yourself into the public with your exhibition with the biographies that enrich your life and your seminars – and therefore that you are in constant conversation with us who are trying to live this most important goal – a self-aware life lived with love for the all embracing world.THANK YOU for that! Thoughts about it managed me to combine many feelings’ reflections with thoughts.. And this had started my inner work, that indicated variance in my living. And so, how I not ran away from my feelings and inner wishes, they appeared against the way I used to live last years. So working on it I realized that my living in Moscow’ style , meant home-office-home-sleep-wake up for the office-home-ironing-sleep-wake up for the work… was not the way I want to live and I realized eventually what do I really want to live for, how and what are my values, what can I do for people etc..
And suddenly on this way of musing a gorgeous woman, who mastered me on the starts of my career wrote a letter to me about her new project and I felt that is it!!! That is the way. So I need to thank you for showing me the way out of my inner secret box, where I got used to hide myself! I will tell you more details a bit later, as presently I’s even hard for myself to realize what happened. The thing is: when I heard my inner consciousness, I could realize it into word, and sent it to the person whom I felt the right one – et voila! transformation in my live has been started.) this is a private part. Before we met personally there were some representing printed matters I read. The stories of brightest moments of some heroes which Deborah could use as an argumentative base for her ideas in the research. A day later we met and we could see the “showcase”. It was impressing by its clearance and simplicity of getting out its message. Black and white photos of “heroes” who shared their stories. Nothing unnecessary, nothing undue. It referred to our feelings to scope out the one from whom to begin. As if we see a man in on the street and think for a while – what profession is he or what kind of a person. Think we opt people a kind of alike us in some meaning and their stories reflect into some ours. That also switch on our feelings. In this way we could step from one story to another, biding in our impressions. Mrs. Ravetz discussed with us her message. A great part of which is personal inner consciousness that plays a major role in our life forming. All the stories can be integrated under this point. As the moment when “heroes” discovered their inner selves and realized it into their lives was the defining moment. So often we do not let ourselves feel what we feel, instead of increase it in our lives practically by our wishes, ideas, that come from our inside cogitation. We use to “try on” and “wear” society standards, modules and clichés. And so often have even no idea about the other way, not let ourselves to discover our emotions and feelings, but instead we block it to both: ourselves and people around us, therefore we do not let this energy to come in our days. This is not about the social values’ substitution, but the way of self- realization, personal way. Our lives are each unique. And each person experience in feelings, knowledge and relations is a unique resource to create a self, to make human sculpture. As a human being is a creator, who has this unique gift by nature. Reaktionen einer 11. Klasse, die das Projekt in Deutschland besucht hat. Die ganze Situation bei der Ausstellung hat mich zunächst ziemlich überrascht, und ich hätte mir gewünscht, mehr darauf vorbereitet zu werden. Doch das hat natürlich nichts mit der Ausstellung an sich zu tun. Diese hat auf jeden Fall Spuren in mir hinterlassen, denn so ein „peinliches Schweigen” haben wir mit der Klasse noch nie erlebt. Wir sind sonst sehr lebendig und lebhaft und von daher zeigt die Reaktion des Schweigens auf jeden Fall auch, dass es Jeden in irgendeiner Weise berührt hat. Die Fotos haben die einzelnen Geschichten der Ausstellung meiner Meinung nach noch ziemlich verstärkt und es war gut, Gesichter zu jedem einzelnen Schicksal zu haben.Es waren teils ziemlich emotionale Schilderungen. Diese preiszugeben, kostet sicher viel Überwindung, kann aber vielleicht anderen Menschen bei der Suche ihres tieferen Selbst behilflich sein. Angesprochen haben mich die vielen verschiedenen Schicksale der beschriebenen und befragten Personen. Auch die lebhafte Gestaltung der Ausstellung fand ich durchaus bewundernswert. Äußerst spektakulär waren auch die Bilder zu betrachten, da diese durch ihre Perfektion, schon auf den ersten Blick. sehr emotionsvolle Vergangenheiten erkennen ließen. Angesprochen hat mich, dass so viele völlig verschiedene Menschen über ihr Leben berichtet haben. Gut gefallen hat mir, dass Menschen aus ganz unterschiedlichen Altersgruppen so offen über ihren Wendepunkt in ihrem Leben berichtet haben. Interessanterweise konnte man oft das Schicksal der einzelnen Personen an ihren jeweiligen Bildern erkennen. Ich bewundere die Menschen dafür, dass sie ihre Geschichte und auch die Fehler, die dazu gehören, einfach erzählen konnten. Sie standen zu sich selbst und hatten keine Angst davor, was die Anderen darüber denken könnten. In der Ausstellung haben mich die Geschichten der Menschen, die dort aufgeführt waren, sehr zum Nachdenken gebracht. Es waren tiefgründige Geschichten, welche schwer sind, von sich aus zu erzählen und welche das Leben verändern können. Ich konnte mich teilweise mit den Personen, ihren Gefühlen und ihrer Suche nach sich selbst, auseinandersetzen und sie mit dem vergleichen, was ich an ihrer Stelle getan hätte. Ich finde die Ausstellung sehr ansprechend, da man nicht über die wesentlichen Gedanken und Gefühle hinwegsehen kann und sich so auf sie einlassen muss. Die Ausstellung zeigt, was viele Menschen bewegt und wie verzweifelt sie manchmal sind und wie hilflos. Der Eine oder Andere findet seinen Weg, ein Anderer erst am Ende seines Lebens. Krisensituationen können uns zu unserem richtigen Weg oder aber auch auf den falschen führen. Wenn man sich jedoch mit seinen Gedanken und Gefühlen auseinandersetzt, findet man meistens seinen Weg. Doch man muss Mut dazu haben. Die Fotos haben mich sehr angesprochen, da sie die Geschichten der Personen unterstützt haben. In einigen Fotos konnte man das Schicksal dieses Menschen lesen. .Angesprochen hat mich, dass so viele verschiedene Schicksale auf einmal uafgelistet waren. Gezeigt wurden Portraits allermöglichen Leute und die Momente, in denen sie merkten, dass sich an dem Punkt ihres Lebens angekommen sind, wo sich das Leben drastisch verändert Auch konnte man manchen Bildern schon ihre Schicksale ansehen. Auch fand ich die Kraisaufstellung sehr dynamisch, da man so einen guten Überblick über alle Bilder und Geschichten hatte. Mich haben sie sehr ausgeprägt und tiefgehend beeindruckt, da ich noch Tage später über die Schicksalsschläge der Leute grübeln musste. essence that lifted each story from the ordinary to the extraordinary. biography. This is how art becomes relevant again. Thanks Deborah! since it’s inception in 1946.
to be a local art exhibition at the Ruskin Glass Centre in Amblecote. significant professional steps in their own development. I employed Deborah to give my management team a developmental workshop. She showed her exhibition to us in such a way that not only did the team get the opportunity to look in to the extraordinary mirror that her exhibition is, but through the presentation she also managed to open their minds and hearts. The experience was powerful, moving, and profound. The team came away with a much deeper insight in to their situation, as individuals and as a group. It had the effect of expanding the team’s capacity to perform effectively. Soon after Deborah had set up the exhibition last May here at the Queen’s Foundation, students were inviting one another to come and take a look, to read the biographies, to pause for a while. Throughout the day it was not unusual to find people – students or staff – quietly wandering around the images and stories, each part of the evolving Directory of Gratitude, being drawn in to a particular biography which resonated for them. I am fortunate to have worked with Deborah recently, and to introduce her and her work to a group of student ministers and ordinands preparing to move into parishes and circuits around the country. It was a time of transition, quite intensely so, into which Deborah brought an invitation to step back and consider not only the lives of others for whom we are grateful, but also our own lives as unique narrative and as gift. Deborah has an effective way of drawing people into attention to the details of those lives and of how we interact with one another, what we become for one another. If my particular group are in any way typical, all kinds of implications follow on from recognizing ourselves as an element, a strand, a component of a greater, organic “living sculpture.” We matter, we all matter, and life is gift. On two different occasions I have been invited to the Ruskin Glass Centre Stourbridge to experience Deborah’s exhibition ‘ Becoming a Self ‘. We are encouraged to read of the experiences spoken from the hearts of others, the courage of their lives expressed, the stories reflect our own human vulnerability; we sense that we have permission to open our hearts to others. The dimension of possibilities shifts and we recognise how empowered we can be. The work is a catalyst for bringing people together to ignite potential for change within the community. truthfulness – there are encounters with prejudice and institutional ‘positions’ ..
the person may suffer consequences in loss of credibility, livlihood, friendship. we’ve got life all sorted. She expressed an interest in the ‘losing space’ ..
there would be time for our conversation to deepen further. At a conference which I attended, ‘Becoming a self’ provided a safe space for engagement and reflection both upon the present art and the ‘invisible stories’ of the exhibition, and of those present. 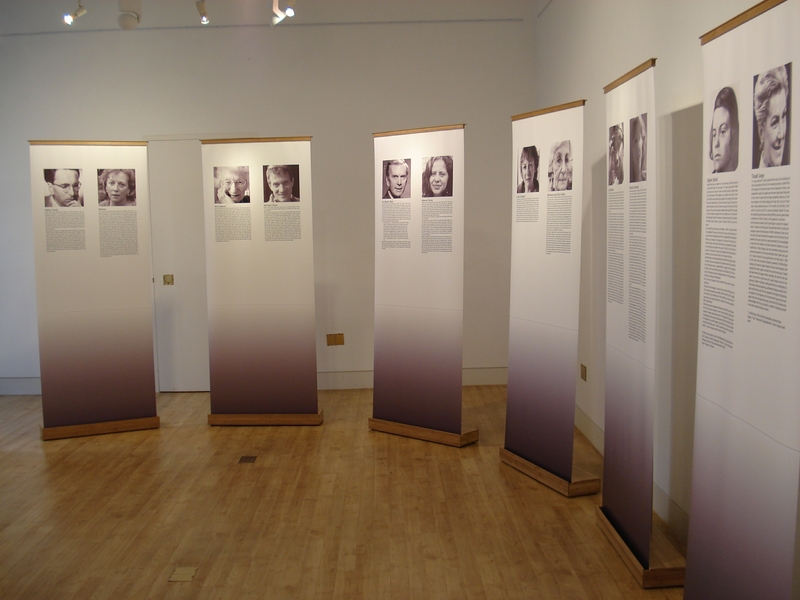 The high definition black and white photo portraits, with their accompanying text on well constructed yet simple rising banners drew the eye and engaged, I suggest, mind, body and spirit in a series of personal stories that had universal resonance with our shared human experiences of living. The banners positioned around the room were suggestive of living presence, which was of course juxtaposed with the absence denoted by the very existence of the photographs. This juxtaposition created a space of stillness and possibility, where the stories of those represented in the photo’s could be understood and augmented by the viewer. This process drew the viewer into the very form of the exhibition, making them subjects as well as observers of the sculpture. In a very real way, the exhibition has been changed and enriched by this participation of the viewer, constitutive of an ongoing work of art. Which, after all, is what we all are – aren’t we? Perhaps surprisingly, one of the most inspiring things to work toward as a priest of The Christian Community is the hope that one day our task will be unnecessary. Yes, unnecessary! This would mean that every human encounter would be an encounter with the Divine. ‘Sacramentalism’ would be so deeply understood and practiced that life itself would become revelation- every experience, every human meeting would be a revelation of God- a Sacrament. Deborahs’ work is a real step toward this hope. Her social sculpture and artistic presentation on becoming a self was so inspiring because it was one of the only times that I truly experienced art as sacrament- the artist as priest. Why? In each human story she gathered, she carefully but organically revealed the all important moments of death and resurrection, moments of dying and becoming, where we decide to totally let go of what we have been, what we had thought and imagined as how things should be and opened up to something radically new. For those with ‘ears to hear and eyes to see’ these are revelations of how Christ actually lives and works in our lives. He is this activity of dying and becoming in us. In this light, her whole artistic experience then becomes a revelation of Christ in us. Her canvas becomes an altar. Thank you Deborah for helping us take another step towards transforming our human existence into a place to know and see Him in all things. Thank you Jonah for your words. Returning to our own Thornhill stories and dramas, I feel daunted. (A powerful – and potentially productive – emotion!) Can I begin clearly to see adversary powers, and to acknowledge the critical parts they play in my life? Can I now start to LIVE my story – not just live out my allotted time? Let’s listen to each other more, neighbour.